Amazon quiz is now on a daily basis but only for 4 hours from 8 AM to 12 AM. 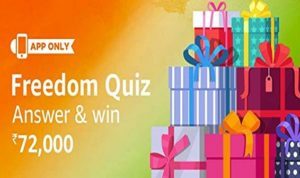 In today’s Amazon app quiz, to celebrate our Independence day, Answer 5 simple questions and stand a chance to win Rs.72,000 Amazon pay balance. Start answering now !! Q1) The ‘Hornbill festival’ is celebrated in which of the following states of India? Q2) What is the name of the network of highways that connects the four major cities of India – Chennai, Kolkata, Delhi and Mumbai? Q3) Which Indian city was recently declared as a World Heritage City (WHC) by UNESCO? Q4) Which is the national fruit of India? Q5) Which one of these is a traditional folk dance of the people of Lakshadweep Islands? The draw of lots will be carried out during the Contest Period for the questions and a total of 5 (five) participants will be selected as winners by a random draw of lots. The declared winner(s) will be eligible to win Rs. 9,999 (hereinafter referred to as “Prize(s)”), which will reflect in the winner’s Amazon.in account as Amazon Pay Balance.